Slow digestion, also known as gastroparesis, is a condition affecting normal motility in your stomach. Generally, strong muscle movements propel food through the digestive tract. However, with this condition, your stomach motility slows down or doesn't function at all, leaving you feeling full very quickly when eating, nauseated, or bloated. Continue reading to learn more about slow digestion problems and causes to get back to proper gut health today. 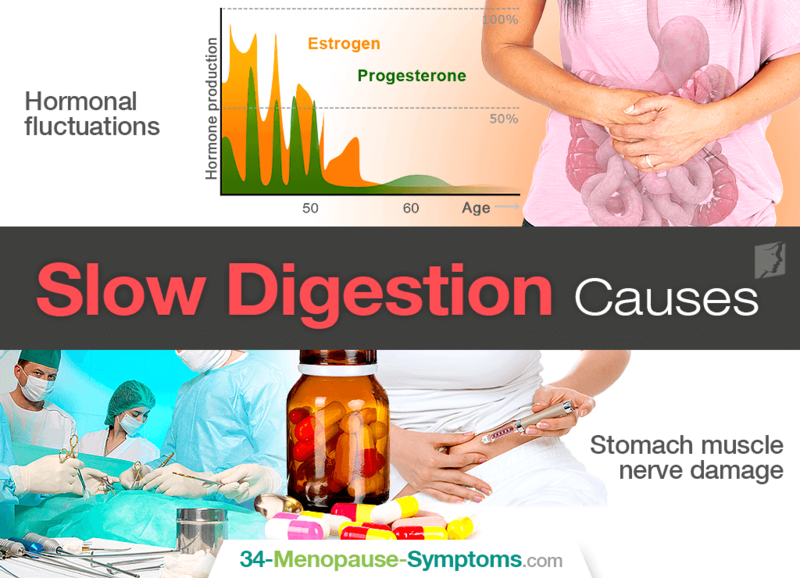 Because women suffer from slow digestion more so than men, it is believed that the most common cause is due to hormonal fluctuations, especially those that take place during the menopausal transition. During the luteal phase of the menstrual cycle, women appear to have slower rates of gastric emptying, leading to slow digestion problems. Research studies have tried to examine the effects that estrogen and progesterone have on gastric emptying in general, but further investigations need to be pursued before conclusions are drawn. Other causes of a slow digestive system due to stomach muscle nerve damage include poorly controlled diabetes, surgery complications, medications, Parkinson's disease, amyloidosis, scleroderma, and more. Keep in mind that slow digestion differs from poor digestion, which can also be referred to as dyspepsia or indigestion. Indigestion is a term that collectively describes a group of gastrointestinal symptoms occurring simultaneously, such as pain in the upper abdomen as well as feeling full too soon while eating or uncomfortably full after eating. Treating slow digestion begins with pinpointing the underlying cause inhibiting healthy gastric motility. If due to hormone imbalance, treatments for digestive problems start with simple lifestyle changes. Modify eating habits to include smaller, more frequent meals, and add well-cooked fruits and vegetables and low-fat foods into your diet. Drink plenty of water to prevent constipation. Incorporate gentle exercise into your daily routine after eating, and avoid carbonated drinks, alcohol, and smoking. Alternative medicines - phytoestrogenic and hormone-regulating supplements - can be pursued for increased effectiveness. If due to nerve damage, medications to stimulate stomach muscles may be prescribed in addition to recommended surgeries, such as a venting tube to help relieve any gastric pressure. In conclusion, a slow digestive system can be caused by a myriad of health conditions and medications, making you feel bloated, full too soon when eating, nauseated, and more. However, because slow motility issues occur more often in women than in men, hormones are believed to be the culprit. Thankfully, there are a variety of solutions available to find ultimate relief, depending on what is causing your slow digestion problems. With proper vigilance and management, it is possible to tackle the uncomfortable symptom once and for all.